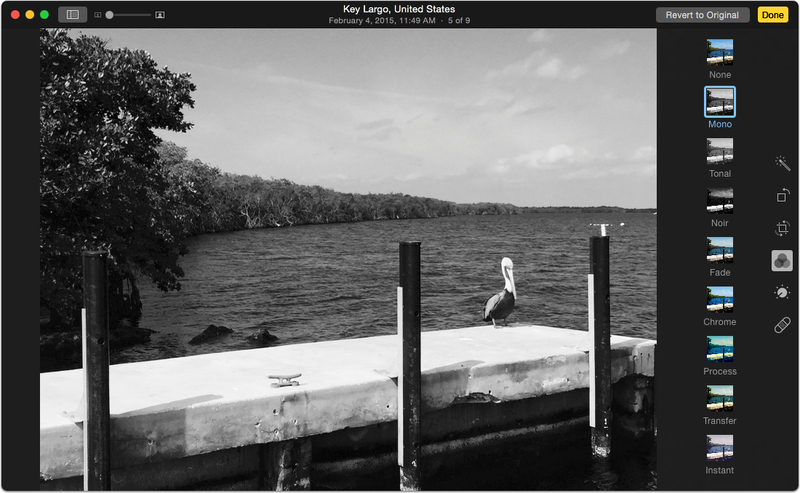 Back in 2014, I wrote a tip about how iPhoto would let you use the Shift key to quickly compare edited images with their unmodified versions. Well, we can do a very similar thing with the new Photos program, but the key you’ll use isn’t the same, and the feature works a little differently, too. Why the change? Because it’s Apple, that’s why. Don’t question it. …and if I hold down M, I’ll see my original image. Hmmm, I think I like this one better than the “emo pelican” version. One of the ways this feature is different from iPhoto’s Shift shortcut is that you can’t compare any cropping you’ve done. Crop an image and press M, and the program will stubbornly refuse to show you the original (and you’ll hear a “you can’t do that” alert sound for your trouble). I really hope that Apple puts that particular ability into Photos—I used it all of the time with iPhoto. It is nice, though, that we’ve still got the former Shift trick, even if Apple decided that they wanted to obfuscate how you do it!